EAMT Symphony Orchestra (EAMT SO) is a launch pad for professional Estonian orchestral musicians. Over time, the orchestra has been conducted by most of the well-known Estonian conductors: Roman Matsov, Peeter Lilje, Eri Klas, Vello Pähn, Paul Mägi, Jüri Alperten, Arvo Volmer, Andres Mustonen, Toomas Kapten, Toomas Vavilov, Risto Joost and Erki Pehk. The orchestra has performed under the baton of several foreign conductors, including Michel Tabachnik (Switzerland), Jin Wang (Austria), Colin Metters (England), Cecilia Rydinger Alin (Sweden) and Lutz Köhler (Germany). Every year, a joint concert by the EAMT Symphony Orchestra and Estonian National Symphony Orchestra (ENSO) takes place, and every two years, a vocal symphonic work or an opera is staged in cooperation with the EAMT Opera Studio. The orchestra, which on the average brings five new programmes to the public each year, has also been recognised abroad. 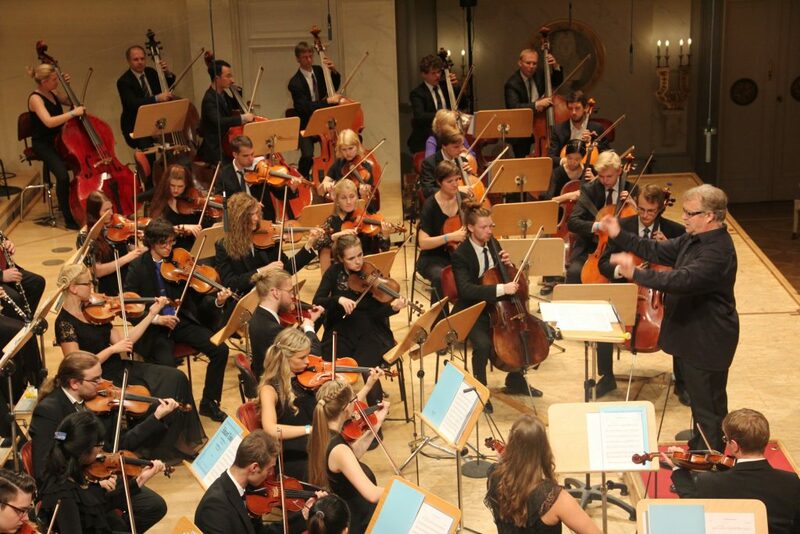 The orchestra has performed at the young.euro.classic festival in Berlin several times, where a 2005 performance of “JenZeits” by Ülo Krigul brought the Grand Prize to the composer in the category of young composers under thirty. Concert trips have also been made to Sweden and Finland. In September 2009, EAMT SO was the main orchestra at the ABAM (Association of Baltic Academies of Music) international orchestra academy. In March 2010, Krzysztof Penderecki’s “Concerto grosso” and “Ciaccona” were performed for the first time in Estonia, where “Ciaccona” was performed under the baton of the composer himself. Conductors who work regularly with EAMT SO are professors Paul Mägi (chief conductor) and Toomas Vavilov. The EAMT Sinfonietta, a practising ensemble, has also been established for collaboration with the Conducting and Composition Departments.